Sign up for a CruiseJobFinder membership for our interview with Aqua Cat, which takes divers and snorkelers on around Nassau, Bahamas. Aqua Cat, based in Florida, specializes in liveaboard snorkeling and diving trips. Find out about their hiring process and employment opportunities in this great interview. Please describe your company's niche. Aqua Cat Cruises operates out of Nassau, Bahamas offering people fun-filled, scuba diving and snorkeling adventure cruises, as well as liveaboard diving expeditions to the Exumas Islands. 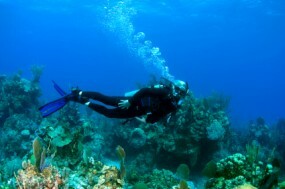 We offer full scuba diving certification as well. We have the Aqua Cat liveaboard dive boat, which offers 11 passenger cabins each with their own private bathroom. Sea Dog is a 28' launch. Then we have the Cat Ppalu sailing catamaran, and the vessels that are part of our sister company, Blackbeard's Cruises, the Morning Star, Pirate's Lady, and Sea Explorer. Describe a typical 'cruise.' What would the shipboard experience be like for a typical employee? Our typical cruises are dive cruises, with employees needing to stay aboard for the duration along with the passengers. We don't mind where you come from as long as you speak English fluently. If you speak another language this is an advantage. Summer is the busiest, but we are usually busy all year round. July, August and September offers the best weather and water temperature. How can someone best make a great first impression with you? We want people who are friendly and easy to get on with. Our tours are aimed at adventurers who are looking for a fun vacation experience, so we want people who fit in with this profile. We want employees who look and sound professional, who are responsible, who are hard working, enthusiastic, and who have great interpersonal skills. Common traits include being social, hard working, enthusiastic and reliable. To succeed in the cruise industry, you must be someone who enjoys working odd hours including weekends, and sometimes very long hours. You have to be comfortable sleeping in cramped cabins and putting on your friendliest, most positive attitude each and every day. Many people do not realize how much hard work is involved and the long hours that are required. While it is all fun and games, you will probably be exhausted at the end of every day. Those who will gravitate towards cruise jobs like we offer are people who are looking for adventure and a great lifestyle that still lets them do what they love and are trained to do.